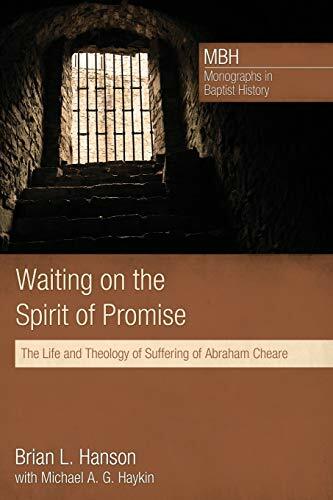 Waiting on the Spirit of Promise is a study of the life and ministry of Abraham Cheare (1626-1668), containing selections from Cheare's works, and rescuing an important seventeenth-century Baptist from obscurity. Cheare has been overshadowed by other more celebrated Baptist contemporaries, but as the pastor of the Particular Baptist work in Plymouth, Devon, Cheare played a key role in the advance of the Baptist cause in the West Country in the 1650s. His Sighs for Sion is an excellent illustration of early Baptist piety. With the Restoration of the monarchy in 1660, Cheare, like many other Dissenters, suffered arrest for his refusal to give up preaching. Cheare's prison writings reveal both a sturdy faith in God and a deep-seated piety. Despite the fact that he was incarcerated in a series of "nasty prisons" Cheare used this time of suffering to deepen his walk with God and so provide a model for his congregation of Christian integrity and joy in the midst of trial. To the very end of his life, Cheare eagerly awaited further outpourings of the Spirit of Promise upon the Church and looked forward to that day when his Lord Jesus would make all things right. Brian L. Hanson (MDiv, The Southern Baptist Theological Seminary) is a PhD candidate in Reformation Studies in the School of History at the University of St Andrews in Scotland. He is also a musician and the composer of several published works including Jesus, Lover of My Soul and The Very Thought of Thee. Michael A. G. Haykin (ThD, University of Toronto) is professor of church history and biblical spirituality at The Southern Baptist Theological Seminary and director of The Andrew Fuller Center for Baptist Studies. He has authored or edited more than twenty-five books, including Rediscovering the Church Fathers: Who They Were and How They Shaped the Church.